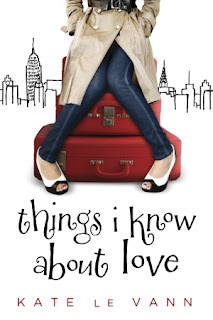 6 of 10: Things I Know About Love pulls a switch on the reader – that cover, the premise, the first half all lead you to believe it’s going to be light, fun reading and then decides to be serious and meaningful. Tragically, it doesn’t actually work. I am firmly convinced a book does not have to be long to have good character development (see If I Stay). And some books can even manage to have lousy character development and still be enjoyable or funny. Hooray for fluff books and all that. But what a book probably should avoid is trying to be deep and meaningful without having any real character development. That, my friends, is a hard trick to play. And when this book tried to move me at the end without ever having convinced me to love the characters, well, I was just actually a bit annoyed. That’s American for a blow-dry. But honestly, who pays to have someone dry their hair? Americans are constantly inventing new things to spend money on. But it got much less charming when suddenly there weren’t little funny lines about dating and haircare and it became all SOUL MATES AND THE CRUSHING REALITIES OF LIFE. Let me back up and tell you what the main storyline is. Livia (who lives in England) has had a fairly rough past couple of years, what with being diagnosed with Leukemia around the age of 14. Her friends have been lovely about it, but there is definitely some awkwardness there and she certainly missed out on many normal high school experiences. And the boy who dumped her when she went back into the hospital for a week because he couldn’t deal with a girlfriend who once had leukemia? It’s not doing a lot for her confidence. Now, after graduation, she’s going to America to visit her brother who is studying at Princeton. She’s hoping for a new start, where people don’t know her as “the girl who had leukemia” and maybe even have a little summer romance. And, of course, she’ll be detailing the whole thing on her private blog. And within days of arriving, she meets Adam, who happens to be from England too, and one of her brother’s good friends (in fact, Livia met Adam several years earlier in passing). And after a brief hiccup, they are dating and he’s also, surprise, totally Mr. Perfect. If we examine the facts carefully, it is a pretty basic setup for a nice fluffy teen romance. But then, if you haven’t guessed from the four million times I’ve alluded to it thus far, things take a turn for the mega-serious. This book could have worked so well as just a fun read. The writing is fine, the humor is amusing, and the romance is sweet. Even as it is, it’s not a BAD book. It’s just forgettable and when a book veers into the territory this one does, you know it’s trying hard to be unforgettable and meaningful. But when mega-serious things happen to characters you don’t really know or care about much, when the first half of the book has just been a few amusing laughs and a little backstory, you just cannot be all that saddened. Or at least, I cannot. Perhaps you have more of a soul. What a bummer-it showed promise with a cute cover! I absolutely LOVED it! It made me want to cry at the end because she has a perfect relationship with Adam and just she was sick. I wish she wasn´t sick because she would never have to keep a secret about being sick.